This page will be updated regularly so check back for updates. There has been a great deal of information on the Fukushima Daiichi meltdown in Japan. This page will act as a guide in documenting the more recent material in regards to this disaster — The severity of the disaster has been downplayed by Japanese officials and other foreign governing bodies alike. Many people died from the initial onslaught of the tsunami, but concurrently other disasters are taking place like the continuation of radiation leaking from the Fukushima site. Governments, official reports, and mainstream media are currently downplaying the affect Fukushima is having on the environment, food supplies, health of populations affected, the ocean and marine life. The Fukushima Nuclear disaster occurred when a magnitude 9.0 earthquake off the Pacific coast of Tohuku bombarded the ocean waters causing a massive tsunami. The Tohuko earthquake was the fifth most powerful on earth since 1900(since modern records), and the most powerful earthquake to strike Japan. The tsunami waves generated from the Tohuku earthquake reached heights of over 130 feet and stretched 6 miles inland in some parts of Japan — It was a full blown disaster with the earthquake/tsunami combination alone. Enter the Fukushima Daiichi nuclear facility. Three reactors experienced a level 7 meltdown and it was discovered through investigations these meltdowns were the result of man made error and negligence per the Fukushima Nuclear Accident Independent Investigation Commission. The problem with the news coming out of the troubled complex is that the operating company TEPCO, the Japanese government and international agencies are not being completely forthcoming. Readings taken from snow blanketing St. Louis, Missouri contains double the normal radiation amount, once again stoking concerns that the ongoing Fukushima crisis is now firmly impacting areas of America. (Washington Times) More than 50 U.S. Navy sailors who served aboard ships that responded to the 2011 Fukushima disaster in Japan report falling ill to cancer and other radiation-linked diseases. Defying Japan, Rancher Saves Fukushima’s Radioactive Cows 1/11/2013 Angered by what he considers the Japanese government’s attempts to sweep away the inconvenient truths of the Fukushima nuclear disaster, Masami Yoshizawa has moved back to his ranch in the radioactive no-man’s land surrounding the devastated plant. 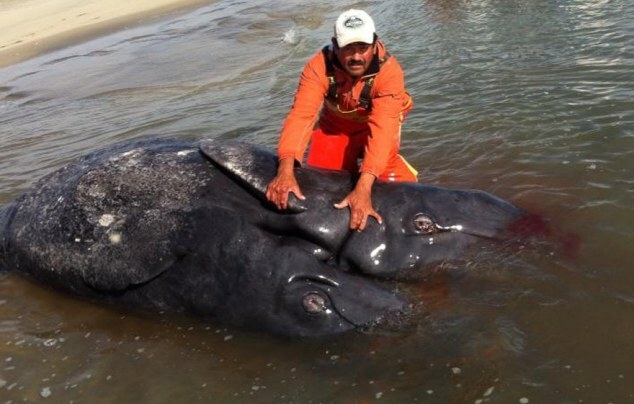 Following continued news of disturbing sea life occurrences off the West Coast, scientists in Northern Mexico’s Laguna Ojo de Liebre, formerly known as Scammon’s Lagoon, have discovered what appears to be the first ever documented case of conjoined gray whale calves. At island rookeries off the Southern California coast, 45 percent of the pups born in June have died, said Sharon Melin, a wildlife biologist for the National Marine Fisheries Service based in Seattle. Normally, less than one-third of the pups would die. <National Report> On August 31st, four days ago the National Report ran the story… Fukushima Crisis Escalates Tons of Radioactive Waste Released into the Pacific Causes Ocean to Boil.. Since then we have been taking calls and emails from people all over the world wanting to confirm our story. Back in December 2012, we wrote that it was only a matter of time before Japan’s criminal lying about the radioactive exposure in the aftermath of the Fukushima catastrophe caught up with it, as well as with countless numbers of people who would soon succumb to radiation induced cancers and other diseases. What we found surprising back then, before the full scale of the Fukushima catastrophe become clear and before even Tepco admitted that the situation is completely out of control, is that those holding Japan accountable were not its own citizens but eight US sailors who have then filed a suit against semi-nationalized energy operator TEPCO – the company which repeatedly ignored internal warnings about the ability of the Fukushima NPP to withstand an earthquake/tsunami – seeking $110 million in damages.